Puzzle - Upstate Films, Ltd. 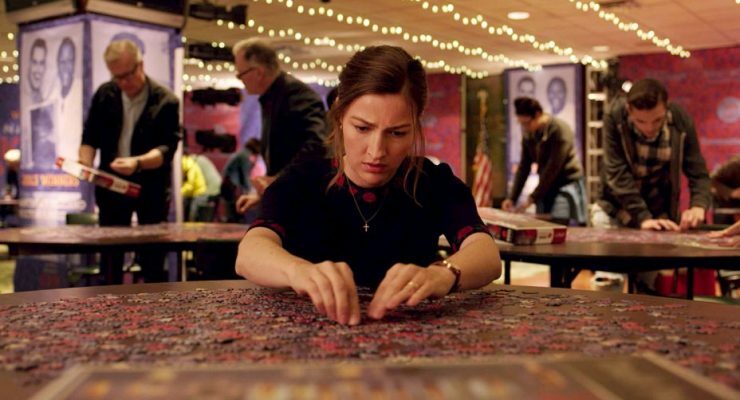 Featuring a notable performance from Scottish actress Kelly Macdonald (Trainspotting, No Country for Old Men, Gosford Park), Puzzle revels in the idea that new things can always be found in our ordinary lives. Agnes lives in the house she grew up in, spending her time moving between home, church, errands, and back again. While her life has a solid foundation, something’s missing. She’s married to a man who loves her (David Denman) but is somehow unable to truly see her. And the sense that she could be excellent at something is long-dormant. But something small changes in her when she opens a birthday present containing a 1000-piece jigsaw puzzle. While this project might take the average person several days to assemble, Agnes begins it one afternoon and finishes before her husband comes home — twice. Excited for another challenge, she heads to a puzzle store in NY City, where a small note hanging from the register changes her life. A champion puzzler (Irfan Khan) is looking for a partner. With meticulous direction and a script that’s graceful in its details, there’s a sense that craftsmanship has gone into making sure all of Puzzle’s pieces fit satisfyingly together. R / 1 hr 43 mins.